This week, we’re covering Achilles tendon injuries quite extensively. Injuries to the tissue connecting the heel to the calf muscle are quite commonly treated at The Center For Podiatric Care & Sports Medicine. You could say it is one of our specialties, along with bunion surgery and plantar fasciitis. Today we came across the story of Mike Fisher, center for the Nashville Predators ice hockey team and husband to country music star Carrie Underwood. CBS News reports that he will be out four to six months with a ruptured Achilles tendon. His tale really underscores the severity of an injury to this part of the body and a lengthy recovery process that no one wants to face. 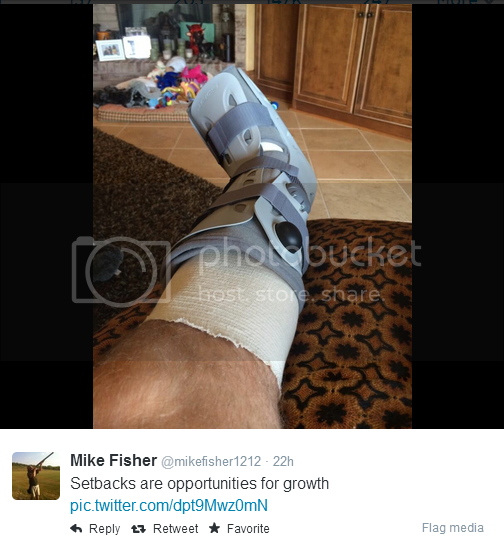 On July 7, 2014, NHL player Mike Fisher tweeted this image of his post-surgical boot following an Achilles tendon rupture. What Happened to Mike Fisher? How Do Achilles Tendons Rupture? Achilles tendon ruptures affect one in 5,000 people. The tendon tears in response to high force, stress, or pressure. We tend to see the injury happen when people are forcefully pushing off with their feet in basketball, sprinting events, or tennis matches. The calf muscle contracts too much, placing a burden on the Achilles tendon. We’ve also seen people damage their tendons falling or suffering a puncture wound in the back of the tendon. We also find many of our patients have excessive tightness in their calf muscles and hamstrings, which places a larger burden on the Achilles tendons. This condition is just a simple matter of biomechanics — how we are built, how we move, how we respond to stress. Of course, some of the issue can be resolved with proper physical therapy and targeted strength training, which we can help you with here at The Center For Podiatric Care & Sports Medicine. Active patients, in particular, generally opt for surgery because non-surgical tendon repair is associated with a high risk of re-rupture. By contrast, surgery is said to reduce the risk of a future rupture by 8.8%. Why Do Achilles Tendons Heal so Slowly? Our NYC podiatrists and sports medicine doctors are often asked why it takes so long for the Achilles tendon to repair, even after surgery. In a nutshell, wound healing is all about cell production, oxygen supply, and blood vessel systems. Unlike the skin — which has a vast network of superficial blood vessels to transport oxygen quickly and efficiently — the ligaments and tendons simply do not receive as much blood and oxygen. We’ve found ways to sidestep this problem, though. Much is being done with platelet-rich plasma injections these days. We offer this type of innovative treatment at The Center For Podiatric Care & Sports Medicine to help you get back on your feet sooner rather than later. We’re guessing Mike Fisher is receiving expert care as well, since the estimates for his return are relatively optimistic for an Achilles tendon injury. If you need Achilles tendon repair in the New York City region, you may book your appointment online.